On the menu we had brioche because my mother made some wonderful fingerfood that did perfectly match with the brioche: coloured and filled palatschinken, which are very common in Austria (they are comparable to pancakes or crèpes, and most typically filled with apricot jam, but millions of variations, sweet and savory, gratinée, rolled or flambée exist and I like them all! ), and filled eggs (salmon, crabs, red caviar, egg salad, cream cheese). They were so good we even decided not to open the paté-jar. 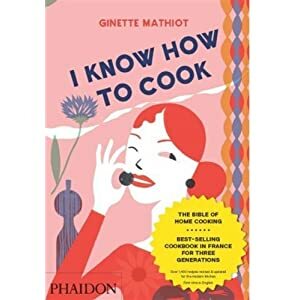 This time I made the brioche with the quantities recommended in Ginette Mathiots book (edited by the wonderful Clotilde Dusoulier of Chocolate&Zucchini), but according to Dorie's method. For the really sweet part we had the chocolate berry tarte that was due for TWD three weeks ago (I opted for making half with blueberries and dark/milk chocolate and half with raspberries and white chocolate as seen here on Tia's great blog Buttercream Barbie). For the original recipe of the Soft Chocolate and Raspberry Tart, have a look at the book (p.354) or head over to Rachel's blog Mommy? I'm hungry! (what a nice name...)). And because all the easter eggs, chocolate bunnies and edible grass wasn't enough to accompany it, I brought some Crème Fraiche Icecream, partially marbled with berrie sauce, too. The recipe comes from David Lebovitz' Perfect Scoop, who I always trust when it comes to frozen desserts in any variation). 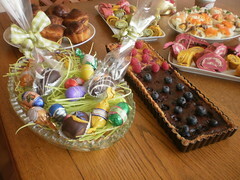 My mom and me, we are still no chefs, but we give our best, and I think the fingerfood my mother made is extremely good looking, so - I don't no what you think, but I definitely liked our Easter table! And for the TWD catch-up: I don't know what's wrong with me, but this tart is not an all-time favourite. I like berries. I like chocolate. I love tarts. But, first, as much as I love tarts, I am just physically unable to make a correct, good looking tart shell. Doesn't work . It's either too dark, or not completely baked trough. It's always, always too crumbly. I never arrive filling in the right amount - it's either getting too thick or too thin. Hmpf. And secondly, I did not particularily like the consistence of the chocolate filling. I liked the little "test"-piece I made better, which was full of mixed berries and had only a little amount of chocolate sauce. It's not that I completely disliked it. I am more like indifferent to it. But as chocolate and berries are usually a winner, and tarts are wonderful, especially as the weather is getting better (I don't go for very rich cream cakes at any time of the year, but the warmer it gets the more I crave for slighter, lighter, more fruity sweets), I am sure I am the problem, and not the tart itself.